The Chairman welcomed Mr Ken Jones, Chair, Mr Mansell Bennett, Vice Chair and Mr Sam Dentten, Acting Chief Officer, Hywel Dda Community Health Council (HDCHC) to the Council meeting to discuss the HDCHC’s Operational Plan 2018/19 and the Hywel Dda Health Board plans to reconfigure health care services. 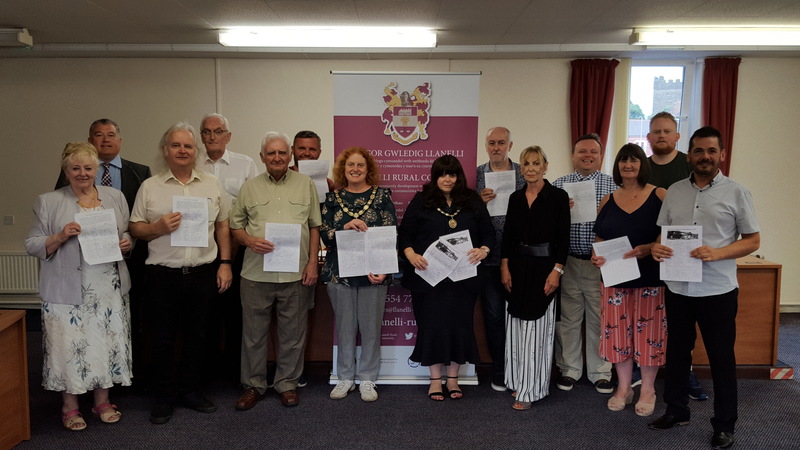 Mr Dentten thanked Members for the opportunity to attend the meeting and after speaking about the Community Health Council’s operational plan he turned his attention to Hywel Dda Health Board proposals to reconfigure health services. He stated that during all his time working with the NHS he had never seen anything of this magnitude and the HDCHC was convinced there was a need for change. He qualified his remarks by stating what wasn’t compelling was what form change should look like and the HDCHC was trying to absorb people’s concerns as there would be winners and losers with every proposal. Mention was then made of the sheer geographic size of the Health Board area with many rural areas to cover; the issues surrounding transport and the proximity to services as well as reference to Llanelli’s long history of service upheaval. Mr Dentten felt the broader issues concerning the impact of south east Carmarthenshire hadn’t been discussed enough in the current consultation. Mr Dentten added that the proposals set out such a big change that most people believed it couldn’t be delivered. From the HDCHC’s perspective if GP services; social care infrastructure and integration; travel and transport; capacity of community services were not in place now it was difficult for people to see them all coming together and working well in the future. Members responded with a number of points and questions and felt the proposals were divisive as communities would fight to retain local services and hospital provision based on the current model. Furthermore, the existing hospitals serving the south of the Health Board area were located in places where they were best placed to serve the larger population centres. It was very alarming that the Health Board claimed under its vision statement annotated on its website that “Making a difference – our doctors think our proposals will make a lot of things better, but it might be difficult for some people to get to the services, especially if they do not have much money or a car!” Members commented the NHS was available to everybody regardless of their circumstances. The vision statement implied that in certain situations it was fine to discriminate against particular demographic groups so in that sense the proposals were all unacceptable. Nobody should be disadvantaged by future reconfiguration proposals especially the elderly and people living in poverty. Members expressed disappointment the Health Board had not produced any evidence or business case to support making changes. The public had not been presented with any financial modelling information to try and take stock of the emerging strategies. The Health Board also had no guarantee that Welsh Government would fund a new build hospital. A number of issues had not been identified in the consultation namely – what dialogue had taken place with the ABMU Health Board to discuss the inevitable migration of patients in east Carmarthenshire if A&E is moved further west. There was also no reference to conducting an impact assessment on whether Morriston had the capacity to cater for a wider catchment area of patients coming from Llanelli, Ammanford, Llandeilo and Llandovery. Funding followed the patient and so the prospect of residents not electing to use the new urgent care hospital in east Carmarthenshire because Morriston would be closer, undermined the sustainability of the reconfiguration proposals, this would jeopardise funding; it would impact on budgets and would be detrimental to Royal College accreditation in respect of the skill sets of clinicians linked to case load. This in turn would affect professional standards and the Health Board would be worse off and all the while having an extra hospital to fund and maintain. Transport was clearly a key issue linked to accessibility of services. A reliable and extended public transport service was fundamental given the geographic area covered by the Health Board and yet the Health Board had no direct control or responsibility for this. Members also commented about the important role of the NHS Wales Ambulance Service Trust (WAST) and the difficulties it had in managing patient transfers. WAST needed to be closely involved in consultation proposals as it was clear from previous consultation exercises undertaken by the Health Board that WAST wasn’t fully involved in the service changes whereas it should be from the outset. Having heard responses from the three HDCHC representatives including views expressed about the likelihood of receiving the necessary funding from Welsh Government which would be predicated on a robust business case, the Chairman thanked representatives for attending the meeting and for taking the Council’s views and comments on board. Prior to closing the item, all Members were encouraged to complete the consultation questionnaire on an individual basis.